Our U12 golfers had the pleasure of playing Carlyon Bay Golf today on what was simply a warm, and breath taking day. As usual, birthday boy Matt Tucknott and Josh Hancock provided some first class coaching on the short course prior to the tee times. County president Alan Lund oversaw the first tee as is now customary. With the course starting to firm up, we were expecting some good scores and we were certainly not disappointed. In the Boys Congu, Thomas Richards took first place with 24 points, Jay Dingle in second with 21 points beating local boy Hugo (lowest gross of 38) who also scored 21 points. It was Sienna Hickling who won the girls section with 20 points, Charlotte Jenkin (lowest gross of 52) in second with 19 points and Ella Grace Crocker with 18. In our Unassisted Golf Access category, Fred Kirkland from Tehidy took 1st place with a nett 41. Alfred Treeby (lowest gross of 45) placed second with a nett 42, and Harrison Gurd with a nett 43. The Assisted Golf Access section saw some remarkable scores! Archie Ridgewell placed first with a nett 32, Alfie Sanders with a nett 37 in second and finishing in 3rd was William Wilcocks with a nett 38. Well done to young William Uglow who scored the lowest gross of 44. After the prresentation, the pressure was well and truly on Josh Hancock as he was putting to beat the best child’s score to win 48 Easter Eggs. Luckily the kids won, and the eggs were shared. We had a lot of help putting on this day, with golfing parents from Tehidy, St Austell, Carlyon Bay, Radnor and Tehidy all chipping in. Thank you all for a wonderful day. Happy Easter! Granted, it wasn't the warmest day we have ever had but at least it it didn't snow like last year! Weather aside, what a day was had by 50 of the aspiring U12 golfers in the County. We had it all with some tremendous scoring across all the categories. This year the County laid on short coaching sessions with Cornwall Director of Junior Coaching Matt Tucknott, and stalwart Mark Hawkey, coaching 40 juniors before they even set foot on the Holywell Course. Continuing his long standing tradition, Juniors President Alan Lund braved the wind and rain for 2 hours ensuring that our youngsters made it onto the course safely. And then it was up to the golfers. Admin, form filling, coaching, safeguarding and starting had all been completed and it was then up the children to show us what they could do. Little could we foresee the scores that came in! The Golf Access assisted category was won by William York from Tehidy with a nett 27, followed by Levi Somerville (33) from Newquay and Will Dingle (35) from the Point gathering 3rd place. In the Golf Access unassisted category, Adele Boumphrey from Whitsand Bay won with a nett 33, from Alfred Treeby from Trethorne (34), and Harrison Gurd (38) mopping up 3rd. The CONGU girls section also had some terrific scoring (and no doubt significant handicap adjustments). Sienna Hickling from Newquay taking first place with 28 points, Genevieve Facey from St Austell coming second with 27 points and young Charlotte Jenkin from West Cornwall continued her progress with 23 points. And the boys CONGU have got the handicap lephrechaun looking for more pencils! In first place was Joss Bailey from Budock Vean with 29 points. Outstanding! In second was young Jack Mallet with 26 points continuing his almost vertical handicap decrease. In third with a mere 24 points (!) was Harry Lusher from St Mellion. Jacob Murphy from West Cornwall only missed out on 3rd place by virtue of countback. Tiernan Wallwork from Tehidy won the putting competition, whilst Hugo Watson and Hannah McGrath recorded the lowest gross scores in their categories. Thank you very much to St Enodoc for allowing us to use your course and facilities, it was awesome! And also many thanks to Nick Williams, the Club Professional who kindly provided use of the range and the balls used for coaching completely free of charge. Thank you to the club house staff, who had to deal with a buzzing environment, and a continuous stream of cheesy chips. Junior golf at it's very finest. 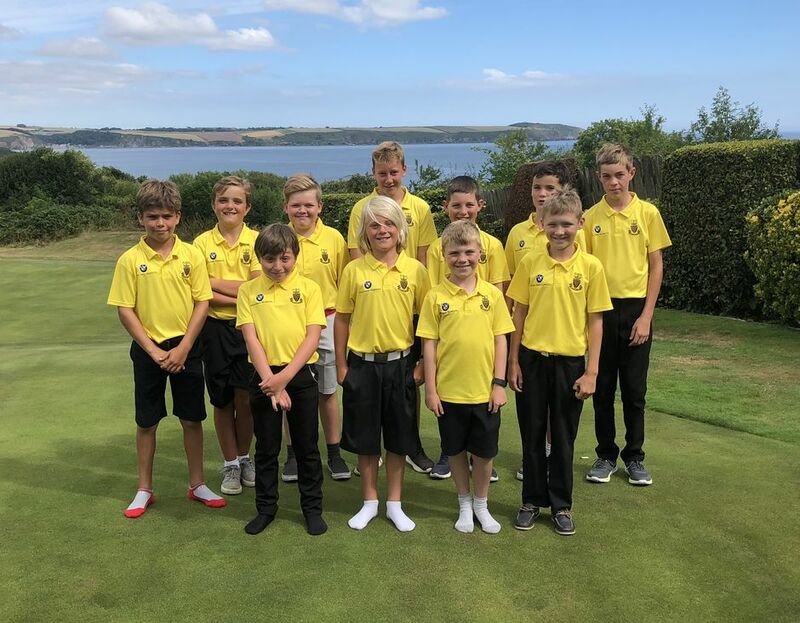 Cornwall U12s finished fourth of the 5 counties competing in the second year of the championship introduced especially for these budding golfers, and which took place this year at the parkland venue Wheathill GC in the far east of Somerset. With the best 4 from 6 scores to count Cornwall finished on a total of 145. Winners were Dorset with a massive 191 from runners up Wiltshire (183). Third spot went to Devon on 148 with host county Somerset just the one point behind Cornwall. The Cornwall team were led by Harry Richards (Carlyon Bay) and the U12s Captain did his bit top scoring for the Duchy with 39 points. Richards was accompanied by Harry Taylor (St Mellion, 35), Hugo Watson (Carlyon Bay, 36), Harry Drewett (Falmouth, 35), Thomas Miller (Truro, 35) and Jack Welch (Whitsand Bay, 33). The CGU U12 squad-pictured above - and the CLCGA U14 team competed today on a sun drenched but beautifully presented Carlyon Bay Golf Course. The first 6 players from each team played an individual matchplay, and the girls played superbly to win overall with 4 .5 points to 1 .5 points. There were some great battles out on the course along with some pretty terrific golf. Young Quinn Bateman played 18 holes of stableford with Daisy, as the rest of the squad played 9 holes of stableford. It was the boys who won this section with a terrific combined scores of over 100 points. After the match the players all enjoyed traditional golfing tucker which was, as always, excellent. The best thing about today? The children all enjoyed the day....it was relaxed, fun and everyone talked to each other. .......... Just as it should be! Picture - (Back row L to R: Wilf Gammon, Tommy Miller, Xander Spratt, Harry Richards, Jack Welch, Hugo Watson, Harry Drewett. Front row left to right - Tiernan Wallwork, Heath Coombes, Quinn Bateman and Alfie Middlewood. West Cornwall Golf Club was the perfect host for the finale of the CGU U12 Mini Tour on July 22nd. The course was spectacular, the weather once again roasting and there was a palpable sense of anticipation in the air. Over 50 children competed in their respective categories, and enjoyed a great meal before the presentation. Mike Ellis, the CGU President, and Alan Lund, the CGU Juniors President took charge of the prize giving in front of a packed club house. Many thanks to our sponsors Chinnydipper and Golf Access, to Mark and Jim for the photography work, our officials and helpers, and especially Andrew for his dedication today. Well done to all the players, and have a wonderful summer! Keep practicing and playing! Tehidy Park is a Winner for the U12's! 60 Juniors, blazing sunshine, nervous parents, England wining a football match and a putt off can only mean one thing.... Round 4 of the U12 Mini Tour at Tehidy Park Golf Club. The Presidents Choice Award was given to young Charlotte Jenkin from West Cornwall Golf Club for her competitiveness, determination and cheerfulness. The Putting was won by Xander Spratt after beating Archie Carnegie in a very tense putt off in front of a lot of people! Well done both. James Tucknott won the chipping by a considerable margin, and it was great to see his smile. There was some great golf today, a lot of smiles, excellent behaviour, and a lot of cheering (mainly at the football). That folks is what golf is all about. Having fun in a relaxed environment with friends you will keep for a long time. Huge thanks must go to Tehidy Park for giving us the course today, to the help provided by their active junior organisers, and to Matt Tucknott and Simon Wood for acting as starters. Simon Wood runs the Golf Access company who have sponsored the Tour for the non CONGU juniors by providing their unique scoring system for free. I have got to admit, it is working beautifully! Also to our other sponsors who allow these events to happen. Sunshine, a beautifully presented array of courses, and 59 excited U12’s must mean but one thing - the Tour was at Trevose! On the tricky short course, the assisted and unassisted categories were started by Sue from the CLCGA which gave her the opportunity to choose the Golf Foundation Presidents Choice. The Congu categories played the longer Headland Course, and we saw some pretty special scores roll in. The winner of the Golf Foundation Glassware was William Uglow. Always immaculately presented, cheerful and polite! Xander won the putting comp with a very good 14, including a number of hole in ones! Finley won the unassisted category with a nett 38, with Ella Grace coming 2nd with a nett 40. The assisted category was won by Harrison Gurd with a staggering 6 over gross, nett 26, and 2 twos as well. Young Isla from Newquay came 2nd with a nett 30, and Joss from Budock Vean continues his development with a nett 31. The Girls Congu was won by Daisy with a terrific 23 points, whilst Hannah scored 19 to come second. The Boys Congu saw club member Wilf win with 24 points, Alfie 2nd with 23 points just beating Borja on countback. Scoring was great, behaviour was great, and the courses were... well.... great! A wonderful day! Thank you Trevose! Well that was a day of 2 halves.... rain and strong headwinds developing into very warm sunshine. Anyway the initial weather did not detract from a cracking day at Newquay with some of the juniors posting some terrific scores! The Presidents Choice winner of the Golf Foundation Skills for Life went to Olivia Hurst for a good sense of humour! We even had some twos and congratulations should go to Joss Bailey (Budock Vean) and Sienna Hickling (Newquay). A fantastic day made all the better by really good behaviour by all, especially the adults!! Many thanks must go to Alan Lund, the Juniors President, who continues to give up his time to act as starter, and of course to Newquay for their generosity. It is very much appreciated! U12s Take on the Bay! Following the recent snow that curtailed the first U12 event at St Enodoc, the rearranged competition at Carlyon Bay was played in unusually dry and sometimes even sunny weather. 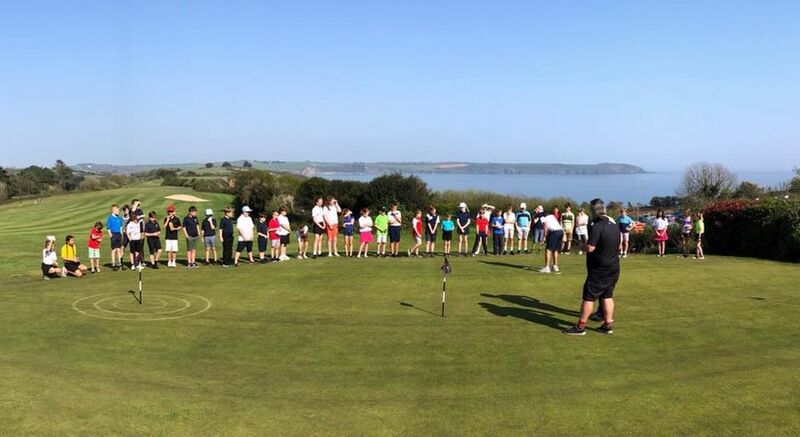 With 50 young golfers taking part, the event was a fantastic opportunity to play a lovely course with some spectacular views of St Austell Bay. As usual, the behaviour and attitude of the players was first class, as was some of the golf that was witnessed by the officials from the CGU and CLCGA. Hugo Watson (Carlyon Bay) won the chipping competition, and the putting challenge was won by Tristan Woolcock (West Cornwall). The presentation was managed by CGU Juniors President Alan Lund, who also spent 2 hours as starter. The clubhouse was packed which was wonderful to see. This year the CGU, in conjunction with The Golf Foundation, introduced a Skills for Life award. This is not nessarily a traditional golfing award but is more targeted towards identifying key skills such as honesty, cheerfulness, manners and attitutude. The deserved winner of the glass trophy, and four ball on The Famous Nine Course was Kai Dingle (The Point). It was awarded for his very polite and cheerful demeanour. Many thanks to our sponsors Chinnydipper and Golf Access, and to Carlyon Bay for the use of their course and their great hospitality.